Dental implants are one of the best advances in dentistry in the last 20 plus years! Basically, a titanium “screw-like” fixture is placed into the bone where the teeth are missing and this can be utilized in various different ways to build your teeth back. This can be a great option for a single missing tooth, or multiple implants can be used for bridges and even full mouth restorations. 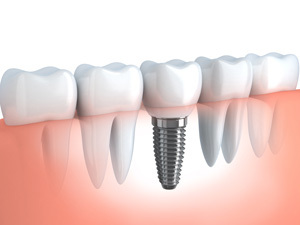 When a single tooth is missing, the implant fixture acts like the root of a tooth. Once this implant has integrated with the jaw bone, impressions are made of the area and a crown will be fabricated to mimic the crown portion of your previous tooth. This crown can be either cemented or screwed into the implant and looks and functions like the patient’s own natural tooth! It is really the closest thing we have in our dental armamentarium to mimic what you once enjoyed! Contact us about it.